This is an immaculate home away from home. 45 x 12 feet of luxury. Add a 10 x 20 glass room with a 10’6 x 10’ addition and you have it all. One bedroom with a queen bed including under bed storage. Comes almost completely furnished including 2 hide-a-bed couches. Stackable washer and dryer. Bathroom has full size tub and large vanity. Beautifully private landscaped lot with gazebo, outside furniture and BBQ. Two sheds are included as well. Move right in and enjoy your summer on Bob’s Lake. This is a very well cared for unit, that doesn’t show its age. Thirty-seven feet of living space and lots of storage. Cozy living room and dining room kitchen combo with gas stove and full-size refrigerator. Center bathroom with tub and toilet on one side and sink opposite wall. Huge bedroom with mirrored closet and queen bed. Lots of room to walk around. 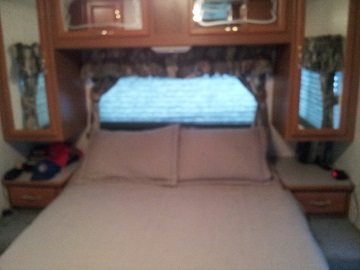 Please note, the trailer comes with a screen room, but not the one pictured in the above photos. Snowbirds take note! Check out this immaculate cottager. 45 feet of cottage living at it’s finest. This 2006 four season model has been lovingly cared for and it shows. 10’ by 20’ 4 season glass room with a bonus 10’ x 14’ screen room attached. Central air conditioning. Will sleep 4. Pull out sofa. Full queen bed with storage underneath. Second bedroom is set up as an office. Full tub in the bathroom. Double door refrigerator new in 2016. Stackable washer and dryer as well. And for those chilly evenings a lovely gas fireplace in the glass room. 2 sheds also included. 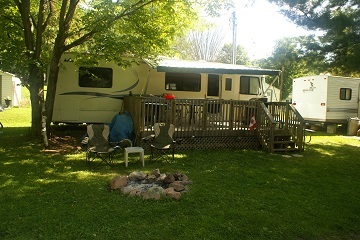 Spend the winters in the warm south and return to a lovely summer place at Sunset Country Campground on beautiful Bobs lake. Call us for an appointment. 32 foot with 2 slides. 3 season 10ft x 17.9ft glass room. Lots of deck space for lounging in the sun or shade. A very nice clean unit with views of the lake. Comes with lawnmower and shed. Also included wooden patio set consisting of 2 chairs and a couch. Situated on site (L9) with a glass room added on, it’s the perfect spot to enjoy Bobs Lake which is just a short walk away. Even though it is a 2009 trailer it has been well-maintained and still looks new. There is a 10’x16’ glass room to enjoy the outdoors while avoiding the bugs or a covered deck to enjoy being outside. Included is a storage shed. Bedroom features a queen-sized bed, large closets, under-bed storage and a door to outside to allow the breeze to blow through. There is a full bathroom with a tub and shower and a skylight for extra light. Living room has a large slide out for the couch and kitchen table to create more space. Couch coverts to a double air bed for guests. Fridge and water heater are powered by 110 or propane, microwave is mounted above the stove, stove is propane, and includes 2 x 30lb. tanks. Furnace also runs off the propane. A/C unit built into trailer and portable floor unit in the glass room. 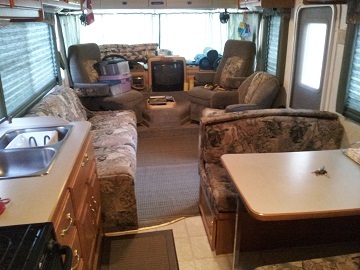 Included are the dishes, pots, pans, portable ice maker, sheds, table, chairs and bar fridge in glass room, all (3) TV’s and DVD players, surround-sound wired in trailer, Bell Satellite dish and cables, and garden hose. NOTE: Glass sun room and trailer can be sold separately if desired. Trailer can be purchased for $12,000. no tax. The sun room can be purchased for $8,000. Buyer must dismantle and remove. This beautiful fully-equipped unit is already set up on a seasonal campsite on Bob’s Lake, ready to move in or move from site. Only 45 minutes north of Kingston, 1.5 hours west of Ottawa and 3 hours northeast of Toronto. Sleeps 6 people. Bedroom has a queen size bed with closets on either side and 3 large storage units above. Full washroom has sink, toilet and shower. Plenty of storage inside and out. Enjoy the beautiful sunsets at Sunset Country RV Park and Campground right from your large deck. Utility shed with bar fridge, lawn mower & BBQ is also included.